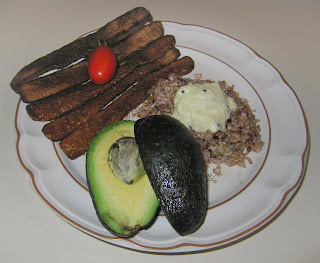 Tonight, I sauteed in very little oil till crispy some smoke-flavored organic "fakin' bacon" strips of tempeh, I also served some brown rice with leftover coconut chutney from a South Indian restaurant. We are lucky to have a local soup chef who sells soup each week. This week, one of her soups was a delicious (as always!) Potage au Pistou (garlic and vegetable soup with basil). 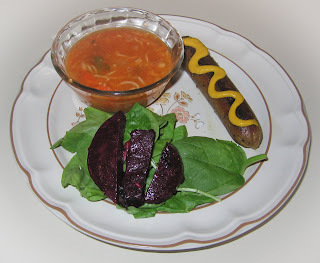 I served that, as well as a mustard-accompanied Field Roast Grain Meat Company Italian artisanal vegan sausage, and a raspberry beet salad that I had purchased. On Sunday, we stopped by to visit a friend of my father-in-law. He was visiting a relative near our home who had just graduated from residency. They were having a pizza party and were so kind as to order a vegan pizza (we checked with this local chain, Tomato Jake's, and they could make a vegan pizza and use a clean cutter). 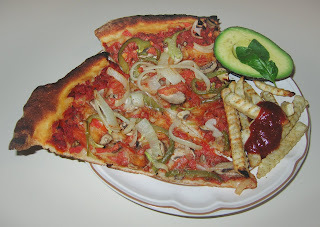 Today, I heated up the leftover slices, and also makde some French Fries, serving it with avocado. I was low on groceries and all three of us were out and about to different destinations, so when I came home and found that my wife had picked up some fresh sourdough bread, I decided to feature that in our dinner. The local soup chef this week had Roasted Corn Soup with Fresh Chives as one soup and Red Lentil-Tomato Soup with Tiny Herb Dumplings - but she left the dumplings out of ours as they were not vegan. When we were in Asheville, NC a few weeks back, I picked up some vegan Teese cheeses made by Chicago Soydairy. I recently was reading at the gym about reinventing the classic American grilled cheese sandwich, and that left a little idea in my mind. I used the open pack of Teese that I had, mozzarella, and made a grilled "teese" sandwich. I "buttered" (with Earth Balance margarine) the top and bottom of the sandwich then cooked it over medium-low till it was golden brown, then flipped to brown the other side. For my wife, I made a simple French toast by "buttering" each side of two slices of bread and grilling them - she avoids non-fermented soy as it upsets her stomach. I loved my sandwich! I was reminded later that the folks from the company were vendors at a conference I attended a few summers ago, and they served these grilled sandwiches which were good! I served the sandwich with organic pickle slices. I also briefly cooked in a little oil some greenbeans then mixed in salt and Volcano Lime Burst (water, organic lime juice, and lemon oil - but just lemon or lime juice would have been fine). Incidentally, I came up last night with a great flavor combination. I put a few drops of the Volcano Lime Burst on cold watermelon - wow! As I described last June, "I was excited today in the grocery store to see wild leeks. I'd never seen these before; also called ramps, they are apparently a rare Southern US speciality." I hadn't seen them since, but yesterday they were at Whole Foods for a dear $19.99 per pound. I made a simple but very tasty meal out of these strong onion-garlic flavored ramps. I cut up half of a container of tempeh into small squared and started sauteeing them over medium heat. After about 3 minutes when the bottoms started lightly browning, I flipped the tempeh and added about ten medium-large shiitake mushrooms that I had cut into thirds or halves. After another minute or two, when the shiitake was cooked down a bit, I added the half dozen or so ramps that I had purchased, cut into 1/2" lengths. When the ramps were wilted and the tempeh browned, after another 3 or 4 minutes, I turned the heat off and poured in a few teaspoons of soy sauce, stirred, and let it get absorbed into the food. My cute little six-month-old daughter started a few weeks ago eating some solid foods, and I thought we might try butternut squash tonight. I had some frozen chunks of squash, which I added to a pan that had a little bit of water brought to a boil. I covered the pan and reduced the heat just to keep a little steam cooking the squash for about 3-5 minutes. It turned out to be a great idea; she wasn't very hungry for solid food all day, but loved the squash. We have been mixing her food with coconut oil to get her more fat, and we did that again with the squash after compressing the soft squash cubes with a spoon. I even tried a bit and really liked it! 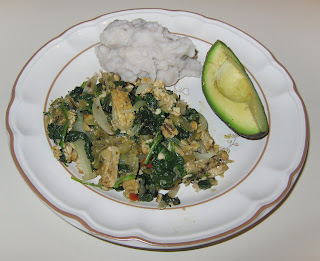 (I have to start incorporating a little coconut oil into an occasional dish for us.) For our squash servings, I mixed in some olive oil, salt, and rosemary needles. I also made mashed potatoes with the leftover water from the squash pan, paprika, vegan Parma! "Parmesan cheese", salt, and hemp milk. Cucumbers rounded out the meal. I call this my three-generation meal because we miss my father-in-law who came for a few months to visit and has since returned to India. He is a fan of strong onions, and would have loved the ramps. Of course, the butternut squash was enjoyed by our daughter. Today was the fifth anniversary of meeting my wife and is now the beginning of the sixth year of unique dinners I've prepared for her - no repeats in five years! I dropped a lot of hints in the meal I made, but my wife missed it :-) ! I prepared a serving of mixed brown and wild rice, cooked in water and a vegan bouilloun cube as I usually do. I served that as the centerpiece then wanted to put five pieces of seitan with five spices down. I was going to use Chinese five-spice powder, but one of the spices is cinnamon, which my wife doesn't like. Instead, I decided to make up my own blend of five spices. When I started investigating my spice cabinet, I realized that the jerk seasoning that I have has five spices! So I used it. I sauteed large spears of seitan, perhaps, roughly, 2 1/2" long by 3/4" thick and wide, over medium heat. As the seitan was reasonably brown, after about 8-10 minutes or so, I added 2/3 of a red bell pepper, cut into 1/4" cubes, as well as pieces of four or five roasted garlic cloves, and cooked for another 3 minutes or so. I dragged each piece of seitan through the jerk seasoning and served five pieces over the rice. Id included an edible pun - five (y)ears of baby corn! I also included five slices of tomato and five dollops of guacamole in my atypically symmetric presentation, that was made complete with fresh rose petals from my organic garden. The meal surpassed my expectations! I had been using a salt-free jerk seasoning, but this time had a bottle with salt included. 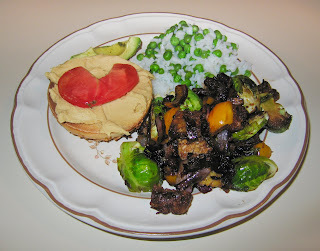 Though I don't use much salt in my cooking, it goes great with jerk seasoning and I loved the seitan! I started baking lovely, locally-grown purple sweet potatoes in my toaster oven at 400°F oven for about an hour (generally, about 40-60 minutes, depending on the size). In the meantime, I cut a large Yukon Gold potato into chunks maybe 1 1/2" by 1/2" or so, and started sauteeing them over medium heat. I put a handful of wide rice noodles in a bowl of hot tap water to soak. I cut up half of a package of tempeh, and put the tempeh into a bowl, covering with Wild Thymes brand Sweet Orange Hot Chili sauce and marinade. I chopped a red onion that I purchased at the farmer's market into half moons between 1/4" and 1/2" in width, and also cut a third of a large bell pepper into thick strips. After about 10 minutes or so, when a fork could easily pierce the potato with slight pressure (i.e., just cooked and not overcooked), I added the onion and tempeh, including the marinade. I cooked for another 5-7 minutes or so till the tempeh started browning, then added the pepper and rice noodles for a final few minutes of cooking. I had an appointment downtown and didn't get home till around 10p, including a visit to Whole Foods Market. 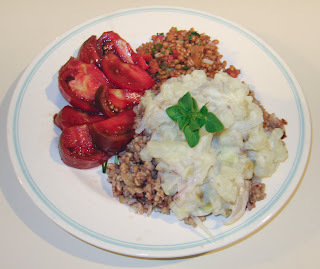 I found a prepared Ethiopian Berber Three-Grain Salad (cous cous, cracked wheat, barley, and sweet potato are the top four ingredients) and a Dijon red potato salad at Whole Foods. 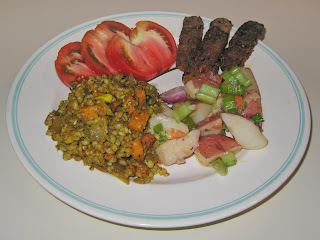 I heated the Ethiopian dish (yummy; I wish we had injera bread!) and served it with the potatoes. Some tomato and sauteed tempeh rounded out this quick, late meal.